Is everyone getting geared up for the holidays?! What better way to start than with this Christmas Contemporary Romance novel! He's giving her children a season of wonder... Dani Capelli seized a chance to start over in a small town with her daughters. Now, facing her first Christmas in Haven Point, she wonders if leaving New York was a mistake. Dani loves working alongside veterinarian Dr. Morales, but her two children aren't adjusting to small-town life. And then there's Dr. Morales's son, Ruben--Dani's next-door neighbor. Gorgeous, muscled and dependable, the deputy sheriff is everything she secretly craves and can't bear to risk loving...and losing.Ruben never pictured himself falling for a big-city woman like Dani. But beneath her prickly facade, she's caring and softhearted and she needs all the love and protection he can give. When Dani's teenage daughter starts acting out, Ruben draws on family traditions to show the girls just how magical a Haven Point Christmas can be. But can he convince Dani that she's found a home for the holidays--and forever--in his arms? This holiday season, don’t miss the latest Haven Point romance from New York Times and USA Today bestseller RaeAnne Thayne, SEASON OF WONDER (HQN Books; on-sale September 25th, 2018). Library Journal calls the fan-favorite Haven Point series “deliciously flirty and totally engrossing,” and SEASON OF WONDER doesn't disappoint with its perfect blend of swoon-worthy small town romance and intoxicating buried secrets. 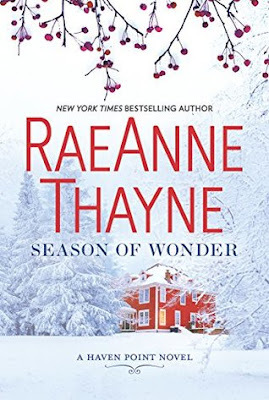 RaeAnne Thayne is the author of more than 50 books and has won numerous honors, including four RITA® Award nominations from Romance Writers of America and a Career Achievement Award from RT Book Reviews.